I strongly believe that dogs are capable of being book lovers. I have witnessed two dogs in my lifetime demonstrate an appreciation of books. They love to get up close and personal and try to see for themselves what their bookish owner loves so much about these papery objects. When I was a small child my parents bought a puppy. She was huge, grey, clumsy and had silky, floppy ears. I grew very close to my puppy as we went through childhood together. During the summer holidays both of my parents had to work all day so I was left at home with my dog to look after me. If someone knocked on the door she would bark and make them go away. If I was feeling lonely she would come and snuggle with me. She was my protective big sister. One day I was reading an old omnibus of Mallory Towers books my mum and I had found in a charity shop. 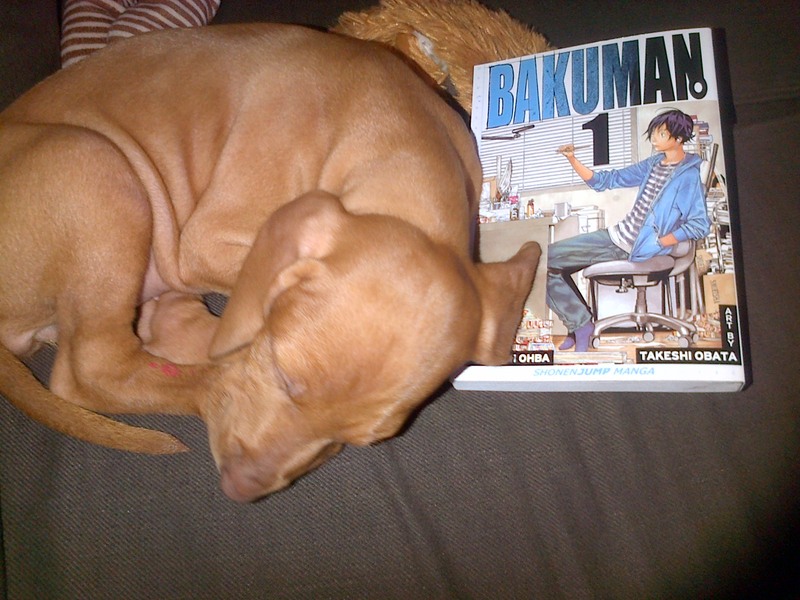 I sat on the sofa to read it and my puppy snuggled up next to me and put her head on the book. Well, it wasn’t a very productive situation to be in but it was certainly a sweet one. 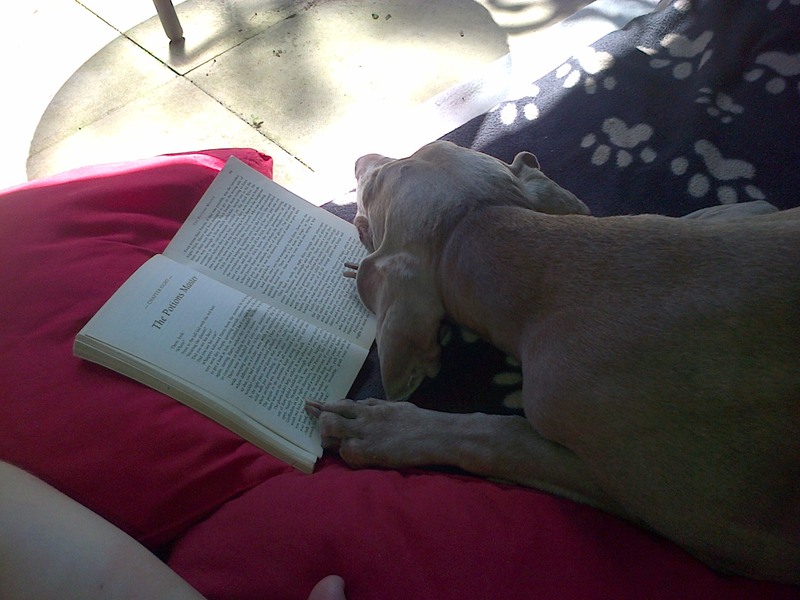 From that day forward my puppy loved to have her nose in a book, preferably the one I was holding at any given time. I loved how we could sit together and share the experience of loving a book, albeit for different reasons. She couldn’t read the words but she could ‘read’ the book as an object and appreciate it as something that was of great interest to me. As she grew up she became particularly fond of the smell of old books. You know, that strange and musty scent that seems to say ‘I am a book that has seen many things and been many places’. My dog LOVED that smell. She loved it so much that she took to licking books. It was especially funny when she licked the portrait of John Milton in my old, crumbly copy of Paradise Lost. Dogs appreciate books as physical objects to be touched, smelt and, uh, tasted. My dog-sister absorbing Harry Potter through the power of touch. We got a bouncy puppy almost a year ago now and I’ve been determined to introduce her to the joys of books (as any big sister should try to do for a younger sibling). I began Willow’s bookish education with manga volumes, but this education was dampened by her need to maul books. Willow, as it turns out, does indeed love books. In fact, she loves books so much that she wants to eat them. I won’t lie, this has led to some tears on my part >.<, she bit a huge chunk out of my copy of The Secret History. Puppies can be very destructive. Eating books is kind of how Willow expresses her love for them. She’s very happy when she’s doing it. Yes, it’s a bit different from how I express my love for books, but it is a kind of love all the same. Luckily or me Willow has been cutting back on book nibbling lately and instead is growing to prefer the licking approach, much like another gorgeous dog I knew.